Located in the New Waverly development at the end of Market Street, the inaugural Edinburgh Cocktail Festival is set to be one of the 2017’s biggest pop-ups. The site will showcase serves from some of the best names in the industry, along with some fantastic food on offer. Buying a £15 wristband will also give you access to discounted cocktails and unlimited entry to tasting experiences and masterclasses for the entire festival. Once you’ve had your fill of cocktails, wash them down with a crisp, cool larger with Paolozzi @ The Arches. Kicking off on 8 August, the Edinburgh-based brewery has brought together a first-class line-up of the city’s freshest creative talent from the worlds of food, drink and art at Waverly Arches. Dram & Smoke was one of my favourite pop-ups last year, so I’m delighted to see it return in 2017. 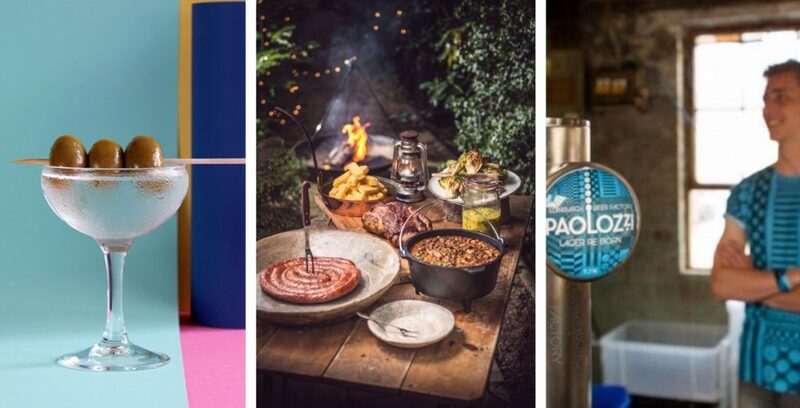 Located in the Biscuit Factory down my end of town (Leith) this year’s Campfire Feast theme – supported by Talisker – draws on the flavours and nostalgia of the fleeting Scottish summertime. Tickets include a welcome cocktail, a four-course tasting menu and tunes until the small hours. Another pop-up celebrating its sophomore year, The A Club sees the centrally located Merchat’s Hall transformed into an old-school cabaret club. Supported by Arbikie, cocktails and food are combined with pop, jazz, folk, rock and classical music acts to make for a truly unique experience. If you prefer your alcohol served on water, then the guys from Scotch Egg Club and Solid Liquids have you covered with their Whisky on Water canal boat tour. Setting off from Akva, guests can enjoy six whisky-based tipples, along with Scotch eggs, chocolate AND cheese, on the two hour trip. If gin is your thing, then you’ll find plenty of it in Edinburgh this festival season, including the Daffy’s Gin Terrace at the G&V Hotel, The Bombay Sapphire Gin Hut at The Blackbird in Tollcross and Caorunn Gin popping-up at Hotel du Vin.